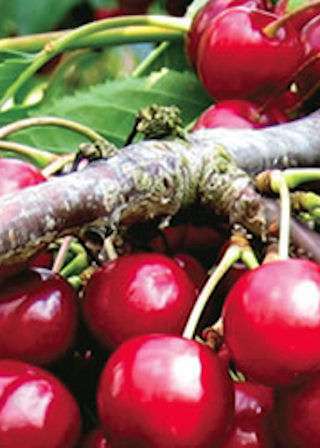 A new very large fruited late Cherry raised by John Innes, Summer Sunshine represents a distinct improvement over other varieties of this Class. The large dark red-black fruits have a delicious sweet flavour and are normally ready for picking in the 2nd or 3rd week of July. In official trials the yield was awarded marks of 8 out of 10 with fruit size described as 'very large'. It is reliably self pollinating providing a good crop when planted on its own and has also shown resistance to bacterial canker. We have also been impressed by the hardiness of the tree and the uniform size and quality of the fruits. Summer Sunshine is quite compact in growth, showing a size reduction of 20 percent over older varieties. An excellent new variety, named and introduced by Chris Bowers and Sons.